The cross-over no one asked for or expected is finally here! Too big for the movie of television screen, Dynamite presents the ultimate Why Not? 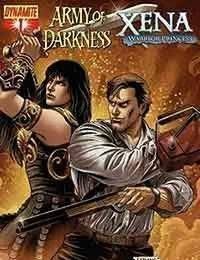 tale as Ash and Army of Darkness meets Xena, the Warrior Princess in the first issue of this 4-part mini series event! Written by master ... uh, scribe, John Layman and illustrated by Miguel Montenegro, the first issue of our most unnecessary adventure finds Ashley J. Williams transported to the world of Xena and Gabrielle and most importantly Autolycus, who of course, bears more than a passing resemblance to our main man Ash. Throw in the Necornomicon and an evil little ash taking charge of a group of fairies (the winged kind) and hey, youve got yourselves a story! Featuring two covers, one by UDON studios and the other by Fabiano Neves!